Hello! 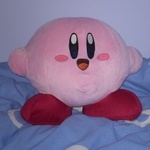 While I'm a long time Kirby fan, this is the first forum I've been on of any kind. I specialize in theories and Kirby lore. I'll try to be as active as I can, and I'm excited to get started! Eyyyyyyyy! Everyone give a warm welcome to shadow! He's like game theory but good! Welcome to the forums! Hope you have a good time here! Hello and welcome to Another Dimension. I think you'll find this forum experience to be nice and mellow.